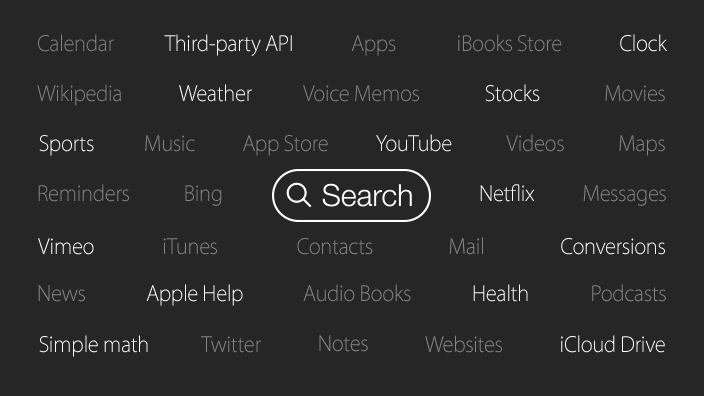 A new software development kit announced by Apple at its WWDC event today will allow developers to leverage search for the first time and show results in Spotlight. Deep linking will allow developers to expose information in their app to Siri and Spotlight directly, then jump right into the app from the new ‘proactive Siri’ experience. A new back button will appear in apps launched from search so users can return to where they came from. The new Spotlight also taps into a number of third-party services, including YouTube, Netflix and Wikipedia. This news is absolutely huge for app developers, who can now surface their apps’ data directly within search and get users to an exact page within their app.